Searching for unique gift wrapping ideas? When you wrap a gift a little differently, your gift is sure to make a memorable first....and lasting...impression, and it will make the receiver feel *extra* special! 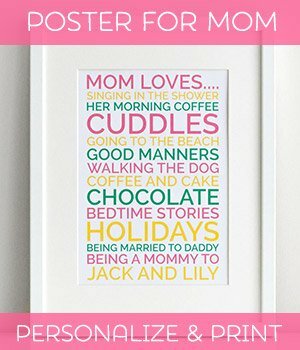 Here I have listed several unique gift wrapping ideas that I have used to wrap gifts for friends and family. 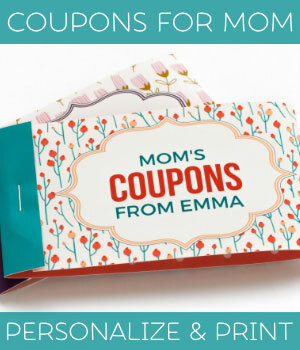 But these ideas really are just the beginning, so have some fun and come up with ways to tailor these ideas to suit your gift! In general, my favourite materials for wrapping a gift come from around the house. I like to re-use and recycle materials because it saves money, it is better for the environment, and my gifts are always unique! Examples of materials I use : old newspapers and magazines; brown kitchen paper; nice pictures from old calenders; gift wrap from received presents; pictures from old cards; fabric remnants; plus pretty paper from my local craft and scrapbooking supplies store. 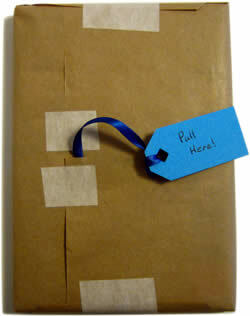 I also rarely wrap a gift without using double sided tape - it really helps to create a nice, neat finish. I love it! To see the unique gift wrapping ideas and instructions, click on the pictures in the gallery below. Or you can just scroll down the page to see all the ideas. You can create a really beautiful effect by layering your wrapping papers. I like to use a plain base layer and a decorative overlay. 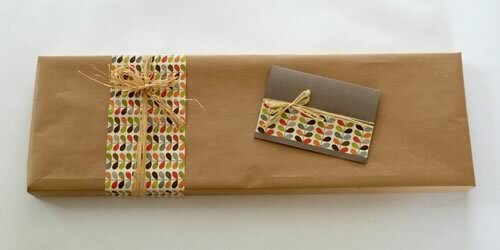 A simple and versatile unique gift wrapping idea is to use brown paper as the base layer. It is inexpensive and readily available. 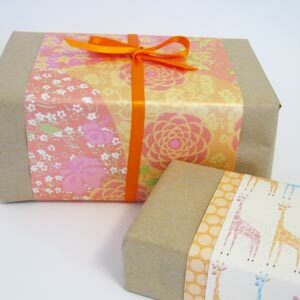 You can then add a strip of pretty patterned paper and a ribbon, or layer different types of paper over the brown paper. I am using brown kitchen baking paper here, but you can also buy brown paper from the post office or any stationery store. 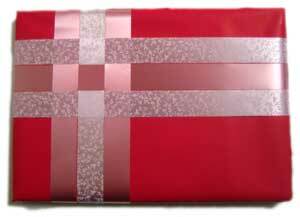 Cut a strip of patterned paper and secured it on the underside of your present with double sided tape. 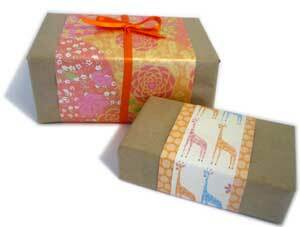 You can now tie a matching ribbon around the centre of your gift, or add another layer of patterned paper. 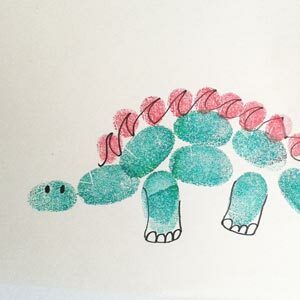 You can offset your patterned paper to one side to get a different look. The possibilities are endless, and the finished product looks great! 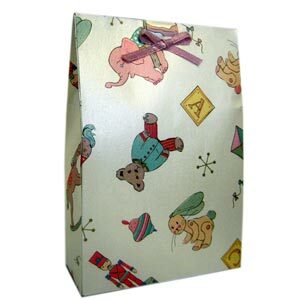 You can make your gift really stand out with funky improvised gift wrap papers. If you are wrapping a birthday present, you could use the newspaper from their actual birthday. Or just find a fun page with an interesting article or picture that you think they would like. 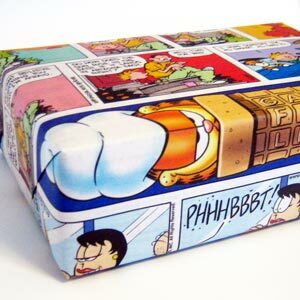 Comic strips from the weekend paper make for a colourful and unique gift wrapping idea. You can make a puffy bow out of newspaper to add to the top of your present. Simply cut out long strips of newspaper, looping them over and securing at the centre with tape. Cover the centre of the bow with another loop of newspaper to hide all the joins. 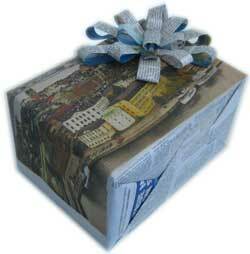 Newspaper is so readily available and inexpensive, and it is a great thing to re-use as gift wrapping paper. Get creative and have some fun wrapping your next present in newspaper! 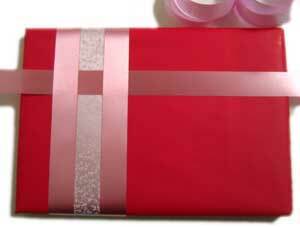 Psychologists tell us that part of the "purpose" of gift wrapping is to prolong the suspense of finding out what the gift is. But what if we turn that all on its head and wrap a gift so that it can unwrapped in record time? 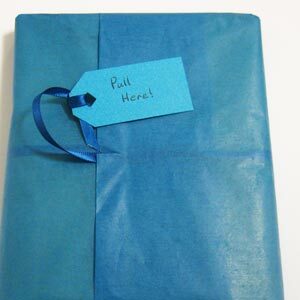 Enter the "rip-cord" method of gift wrapping! Full credit for this unique gift wrapping idea belongs to Kqrpnb over at Instructables . I liked the idea so much I thought I'd put up my own set of pictures demonstrating the technique. Cut a length of ribbon a few inches longer than your piece of gift-wrapping paper. 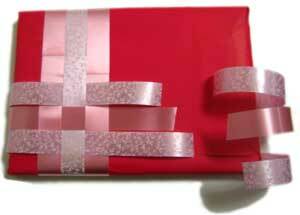 Place the ribbon along the inside of your wrapping paper, and tape it at one end. I've used masking tape here just so that you can see what's going on. 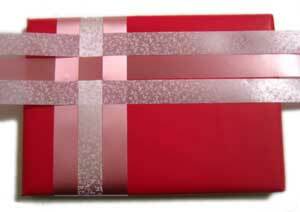 Fold the taped side of the wrapping paper onto your gift. Complete wrapping just like you would normally do. You'll end up with the loose bit of ribbon poking out, to which you can attach a "pull here" tag. I've taped on either side of the ribbon exit point to make sure that the tear will happen in the right place. 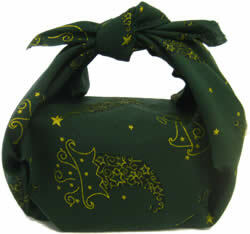 Furoshiki is a unique gift wrapping idea from Japan that looks great and is environmentally friendly. 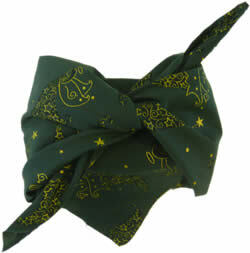 The cloth is a gift in itself and can be reused. 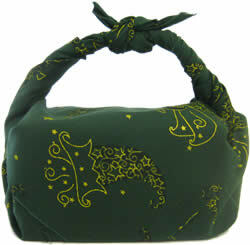 A furoshiki is a traditional Japanese wrapping cloth. 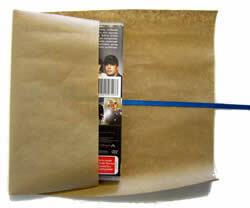 They were once widely used to wrap clothes, gifts, and food, but were replaced by plastic bags in modern times. The Japanese Government Ministry of the Environment is currently promoting furoshiki to be used once again, to cut down on plastic bag use. Below are instructions for my favourite furoshiki technique. If you'd like to try some other furoshiki techniques, you can download this handy pdf of furoshiki instructions . It's the same as the Japanese Government furoshiki guide , but I changed the colours to black and white so that you can print it out without wasting ink. To get started with furoshiki, all you need is a square of fabric . 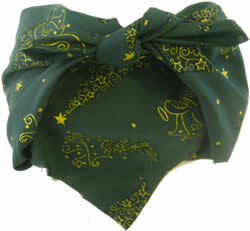 There are stores that sell traditional fabric furoshikis, but you can just as well use a scarf, bandana, sarong, or tablecloth. Take a look in the remnants box at a fabric store, or look for something suitable in a thrift store. I found the piece of fabric below in a remnants box for just a dollar of two. 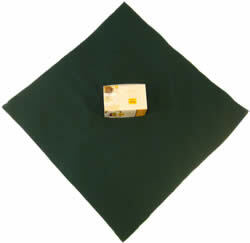 Place the fabric with the patterned side downward, and place your box in the centre of the fabric. 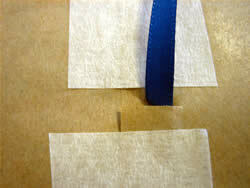 Fold the bottom fabric corner up and over the box, and tuck it beneath the box. Fold the top fabric corner down over the box. Lift up the left and right fabric corners and tie them in a "right over left" overhand knot. Finish up with a "left over right" overhand knot. The finished furoshiki wrapped box! If you twist the left and right fabric corners before you tie them, you can make a handle like this instead. 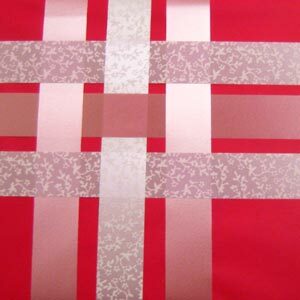 Wrap up your present up using woven ribbon or strips of cut up paper to create an intricate design. 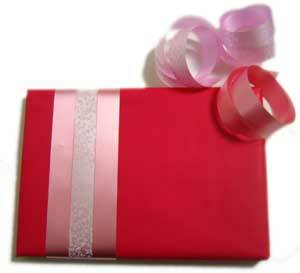 Wrap three lengths of alternating coloured ribbon around your present. 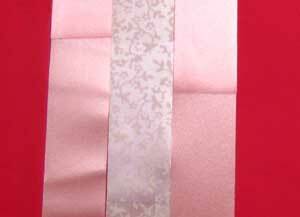 Secure each ribbon at the back with double sided tape. I like to secure the end of each ribbon together, but not attach the ribbons to the present itself. This allows you to alter the spacing of the ribbons after you have completed weaving. With another length of ribbon, weave it perpendicular to the first 3 ribbons, "under, over, under". With 2 more lengths of ribbon, weave them on either side of the previous ribbon, in an "over, under, over" fashion. 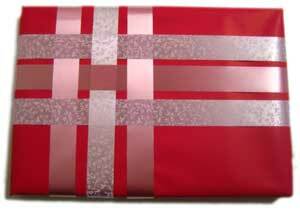 Turn your gift over, and weave the ribbon ends on the other side. Secure with double sided tape. A quick and easy unique gift wrapping idea that looks fabulous! ...or spread out the ribbons and allow some of the wrapping paper to show through the weave. Try this ribbon weaving technique using ribbons with varying widths, or play with ribbon texture and transparancy to create a modern, funky gift that is sure to wow the reciever! 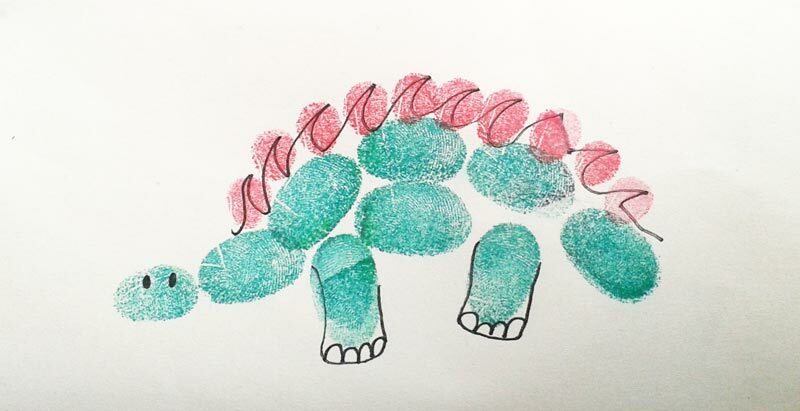 Use a sheet of plain paper to wrap your present, then decorate with finger-prints in the shape of animals (dinosaurs, ladybirds, bears...), flowers etc. So quick and easy to do and a unique gift wrapping idea for kids' presents! My workmates once wrapped a gift for me in a photo-collage that they'd made on the computer with photos of everyone from my office. It was one of the nicest personalised gift-wraps I've ever recieved! Especially nice if you can use music from their favourite song, or a romantic song that means a lot to you both. Perfect for your intrepid friends and family members! 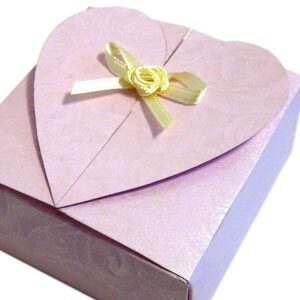 Circle the recipient's birthday for a birthday present, or your anniversary date for a romantic gift wrapping idea. Are you giving someone a cat this year for Christmas? Not sure how to wrap it? Here's your answer! Yes I am joking, I just think this is really cute! I hope you enjoyed my instructions for unique gift wrapping ideas! If you have any comments or questions, or you'd like to contribute your own creative gift wrapping ideas, then drop me a line . Want more ideas? Check out the projects below.